Gauging martial artists by "how they move"
I remember many years ago, sitting on my first grading panel assisting my instructor Bob Davies. I had grading sheets in front of me and was responsible for writing down appropriate, constructive comments on two of the students' performances. At the conclusion of the grading Bob turned to me and said: "What did you think of student A?" I said that I thought student A had made some sequential mistakes in one of his required forms and clearly did not know it inside out. I said student B had executed every sequence properly, but the form wasn't very good. "No. In this case student A passes and student B does not." "But, with respect Sensei, that doesn't seem entirely fair. Student B fulfilled all the requirements where student A did not." "No, student B didn't fulfil all the requirements," he said. Then he pointed to the bottom of the sheet. "It says here that for this level the student should have 'correct form on all techniques'. Student B has clearly not yet achieved this and needs to spend more time at this level until this is achieved to a higher standard – or at least to a point where further study of the material at this level starts to produce diminishing returns." "But what about student A?" I said. "Doesn't the mistake in sequence count?" "Yes, it might. But we also have to look at how a student is moving generally. Student A is re-orienting from another school. You can clearly see that the lessons from that sequence have already been learned by some other means. So there is no point holding student A back merely because of a sequence. Sequences – forms – are there to teach us things. Once they have taught us those things, they can be abandoned." "But won't student A be left with a hole in his knowledge of our syllabus?" "No. Student A can always brush up on that particular sequence another time. And I'm sure there will be many opportunities in class for that over the next few years. Right now we want him to be working on something that will advance the way he moves." My first grading in 1981. My teacher, Bob Davies, is seated and his senior, Johan Steyn Sensei, is demonstrating. In another four years I would start assisting on similar panels, learning the art of teaching and examination. Over the next 2 decades Bob and I discussed many, many more evaluations of student preformances. In many cases the question of grade would come down to this: "Yes – but how is he or she moving? What mattered wasn't some formal exercise or elaborate sequence. What mattered was the lessons it had to teach – and whether or not those lessons had been learned. For this reason, when we get people from other systems joining our school, we give them a 6 month re-orientation period. At the end of that we grade them according to "how they are moving" – not strictly according to whether they can do kata X or drill Y. 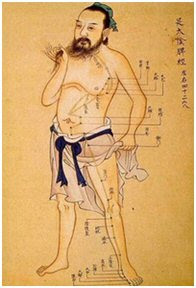 If, say, a student clearly has the kinaesthesia and motor skills of a second dan in our system, it would be pointless to waste the student's time with sequences intended to teach white belt kinaesthesia and motor skills. Generally speaking, students need to be learning something that advances them – not merely something that satisfies a pedagogic (bureaucratic) criterion. Inevitably, re-orienting students can and do catch up on "missing" forms/drills in class time anyway. And if they don't, I'm not particularly bothered (unless they want to become teachers within our system). 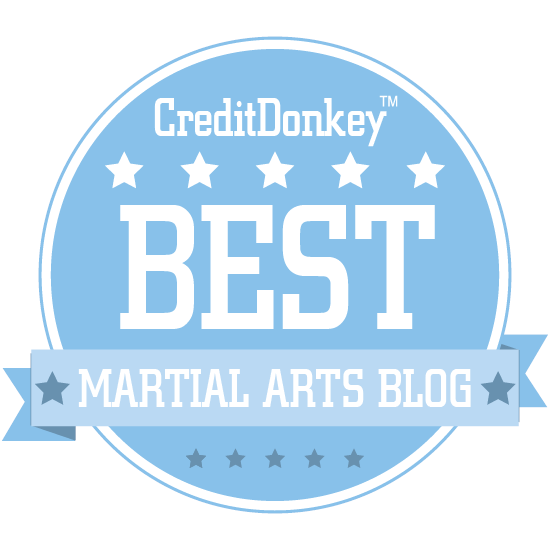 So this raises the question: how important is "good form" in traditional martial arts? 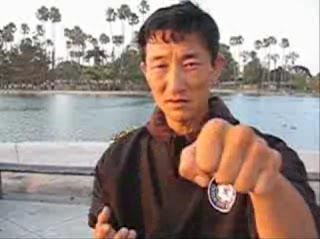 And if it important, how does this gel with the fact that what is "good form" can vary so greatly from school to school (see my article "Punching: alignment and conditioning", for example and note the comparison between the karate and wing chun punches)? Basically my take on it is this: I've seen any number of different stylists (traditional and eclectic) who are really quite different – but are all nonetheless very effective. One thing is common to them all: I can see that they are not beginners. 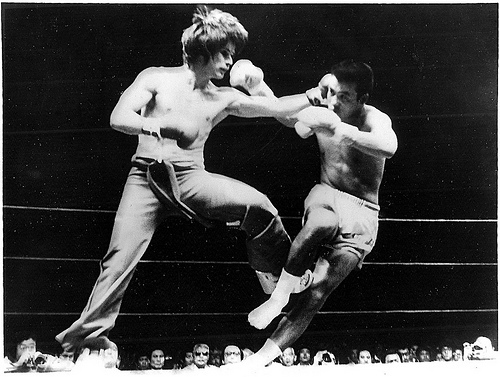 I can see it in how they move – not only in punching, kicking or sparring but also more generally in the dojo. The latter might seem a bit of a cliché, but I nevertheless hold it to be true. And I venture any other instructor or reasonably experienced martial arts practitioner would agree. It's a bit like watching a lead rock guitarist and a violin virtuoso. You can see their advanced kinaesthesia and motor skills in operation, even though they have little in common technically (other than they play stringed instruments). Now with fighting things are a little different, because brute strength can play a pivotal role. But the relative skill will still be apparent. And if you match two people with roughly equal size, weight and aggression, the one who is more highly skilled prevails. 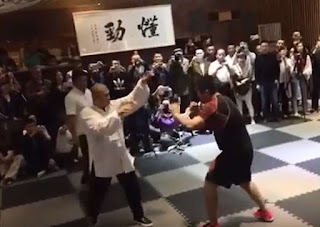 He/she doesn't prevail because of executing "good form" but because he/she has learned vital kinaesthetic/motor lessons from attaining that proper movement - vital lessons the other, less skilled fighter hasn't learned. So what the "proper movement" is all about isn't "enacting" that movement in reality. I think it is about a means of gaining kinaesthesia and motor skills. It is a means, not an end. Going through the process of trying to match your form to a particular standard is about gaining the muscle control and memory you need to perform at that standard. In other words, it's about gaining the necessary kinaesthesia and motor skills required of that standard - not about the standard itself. The "bar" set by the standard is really quite arbitrary. For example, in music whether you gain kinaesthesia and motor skills through jazz "noodling" (as my colleague and good friend Daphne calls it) or through formal classical exercises, you still gain it. You might develop a unique "style" that is quite unorthodox, but it might still be effective. 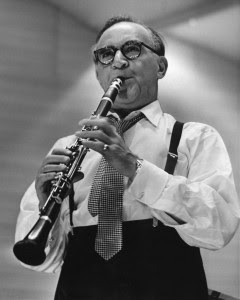 Benny Goodman was a master jazz clarinetist who used to play by biting his clarinet and blowing through his teeth – a very unorthodox technique from a classical standpoint. However, at age 40 Goodman went back to basics and "relearned" how to play in the classical manner - by using his top lip. He mastered that too and became a virtuoso classical player (as well as a virtuoso jazz player). In martial arts this is a bit like that other famous Benny - Benny "The Jet" Urquidez - learning how to grapple from the Machados after many years of success in the kickboxing ring. Or any number of stand-up artists who make a transition from boxing to kickboxing to judo to Muay Thai to BJJ to san shou to MMA - ie. learning to fight under different rules. Every new "style" you master plugs a hole in your kinaesthesia/motor skills, making you more and more adaptable and a better and better martial artist. On the other hand if you start "swapping styles" prematurely you end up with very little. Why? Because you need "form" – not because you want to effect that form "perfectly" in a fight, but because learning that form is a vehicle to help teach you the kinaesthesia and motor skills necessary for your martial arts development. So form is there to teach. After it has taught its lesson, it can be abandoned. It is just an exercise. 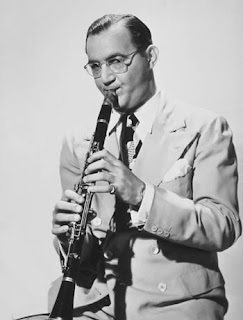 By way of example, if you had studied clarinet with Benny Goodman when he was 38, he would have shown you a very particular jazz style and insisted your do it that way. If you studied with him when he was 48 he would have shown you a completely different style. Which one was "right"? Both were equally effective as vehicles for learning how to play. They produced different, but equally "sweet" music. Having mastered one "style" means you've exhausted the usefulness of the "vehicle" which brought you to where you stand (or at least, the vehicle is running slower and slower and producing diminishing returns for the fuel you put in). Mastering more than one "style" means switching vehicles when the old one has started producing those diminishing returns. But ditching your vehicle after one mile and "going on foot" doesn't make a whole lot of sense. And yes, you could "build your own" vehicle, but that takes a hell of a lot of ingenuity, effort and time - and makes little sense when there are already vehicles out there perfectly suited to the task and that are the product of the hard work and ingenuity of others. I've seen many a "dreamer" attempt to "build their own vehicle" - and get nowhere. You can see how little they have travelled. I've had people walk into my dojo who say they have a "black belt" or even a "5th dan" but to whom I wouldn't give a green (or sometimes white!) belt. That's because they've "studied" some made up nonsense and been given a grade by some "belt factory". On the other hand, I have seen more than a few "shodans" or "brown belts" who are so highly skilled that I can see they simply haven't been graded – that they are 3rd or 4th dans in reality. When I ask them how long they've been training they might say: "Oh – 20 years." And it shows. After 27 years of teaching in my own dojo, I can tell a beginner from an experienced student pretty much as soon as they walk onto the floor. I'm not talking about a "karate beginner" but a beginner - period. I know I can work with a "karate beginner" who happens to be an experienced aikidoka, a judoka or a Chinese or Filipino stylist etc. I can throw them "in the deep end" to some extent and they will "swim". I also know I can't do that to a "true beginner". He/she needs to go right back to square one and start learning some fundamentals – any fundamentals! I don't give a hoot if the student looks offended because I ignored his/her ninja etc. qualifications or years of moving from school to school and doing no more than a few weeks of lessons at each. I don't do it to hurt the student's feelings. It is just a simple fact that the student needs to go off with a personal basics tutor so that I can get him/her to a stage of learning something more than knowing left from right, etc. And I also don't care if the student is a "man mountain" who could literally throw me against the wall. So what? If the student wants to rely on their brute strength, why come to a martial arts school? And why come with an attitude of not wanting to learn? In the end, there is no short cut to experience. And experience can be gained by any number of ways. The important thing is to stick to one method long enough to get it. That is what "good form" is about – sticking to a given method long enough to gain relevant kinaesthetic and motor skill experience. It is not acquiring new "set techniques". And I hold it to be self-evident that if you have the appropriate experience in the martial arts, you can gauge the level of someone else's – simply by "how they move" (but not by their "killer look"!). So true about the movement styles of students and practitioners alike. I classify learning how to walk as one of the most difficult and basic principles of any art. And learning to walk lays the foundation for moving. The ability to move efficiently, under control, and do work is a great measure of any artist. I still don't know what people mean when they say a person walks like a martial artist. Personally, I think they all walk the same. It's when they react that leg work starts to differentiate itself. When some people ask me what former experience I have, I'm not sure what to tell them. I tend to try to keep it vague, both because strangers knowing what you have is a security issue and it's rather hard to explain just exactly what I've been doing for the past 10 or so years. It's certainly not orthodox martial arts, as many people would expect if I said I had training at a dojo or place. It's also hard to hide skills and coordination that beginners would otherwise lack. So when I found myself trying to avoid these questions and answer sessions, inevitably people would pick up on it just by what I am capable of doing or not doing. Some other older martial artists, the ones that went through a formal curriculum of one sort or another at YA, have said that when moving to another dojo, they would get pestered by the younger students asking them to show them this and to teach them that, often to the point where the official instructor was getting peeved. Their background was "out in the open" because one of the students at the dojo was a former student of the "beginner". Technically he has a low mudansha rank, but when they go to tournaments the student addresses him with keigo/politeness, and everyone else thinks he's like upper dan or something. Embarrassing when he gets to the tournament and everyone sees the belt he wears. It's hard to explain the reality that the belt hides. In some ways, people's first impressions were correct. In many ways that beginner did know more than the primary instructor, but he wasn't interested in teaching because he went to the dojo to learn certain things he was missing. He just thought it was a huge hassle when people started treating him as another instructor, unofficial even. Generally speaking, I never understood what separated a beginner from a different kind, until I saw how people reacted to two man drills. Even the safest, simplest, out of range one step strikes, they had trouble coordinating their body with. These individuals certainly had previous training or was training for a year or two. But I suspect copying the forms of aikido did not quite teach them how they should move their body. 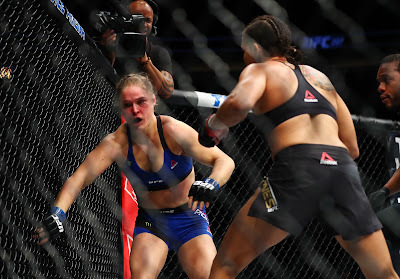 Not with upper arm coordination in punching or blocking. Not with lower leg movements. And certainly not when you combine the two. The two man drills demonstrated this in so obvious a fashion even I noticed. I would often look around for good trainers or good training videos, since it was quite easy to separate the crud from the gold. Benny U did very well in the video matches, but more importantly, exceptionally well in explaining and teaching others in the vids I've seen him teach in. The primary issue with people who are interested in their own style, is that they lack a fundamental understanding of principles. It's like someone who wants to finish Calculus 2 in order to do differential equations and "make his own equation" modeling physical functions like waves and springs and bridge harmonics, except he doesn't even know how to multiply beyond 12 X 12. Certainly maybe he is a genius and he can absorb/copy stuff as he goes, but even still that's certainly a significant amount of work that might otherwise be better spent through a formal system. Well, suffice it to say that most people who want their own style don't have enough of a training background to figure out what that even means. The Shaolin monasteries always had Sun Tzu and the Ancient Chinese philosophical treatises on warfare to build upon when creating Wing Chun and what not. 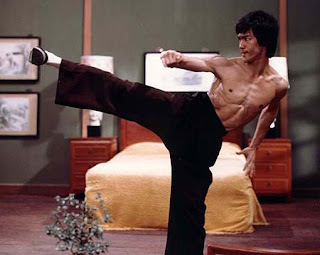 They knew principles, understood them, and could reverse engineer them into a martial art or out of a martial art. That is a basic scholarly background that is the bare minimum for creation. Westerners unfamiliar with Eastern history, who don't even know who Sun Tzu is, wishes to replicate the feats of the Ancient? About 2500 years too early for those kids. Takes just a little bit of maturation before people can start doing something like that. The Ancients never required the usage of forms. It was just a convenient way for them to transfer knowledge or to create a formal curriculum for them to practice by themselves, without enemies picking up the secrets just by watching them train. Experienced fighters can detect subtle nuances in timing between the different body postures and movement sequences, in a fashion similar to video analysis except better fidelity. (Videos are often grainy, at the wrong perspective, and doesn't make use of the brain's advanced parallel visual processing abilities for stereo sight.) The weird thing is, a lot of users from a formal curriculum don't use videos, don't recommend their students use them, and literally cannot analyze anything of worth from even a good video. Such deficiencies speak to me of certain larger issues in play. Because if a person cannot analyze videos, even on a basic level, how are they grading and promoting their students, whose forms are essentially only as good as the correcting eyes of the instructor? This perhaps may lead to entire generations copying forms but not comprehending what it is that they must See. The better users can detect what you are doing simply by the context in which you react to the user's movements. The ones even higher can force you into doing things by being 10 steps ahead, like Benny U. While the Japanese seem overly focused on vision prediction, and the Chinese seem to love seeing through feeling, either one would be great for a beginner to learn. I didn't realize where the bar was until I realized that most of the people I meet who train, would have an accident if they started swinging a shinken around. They just don't have that kinesthetic awareness and control of a tool 27 inches off their hand, because they can't even control their arms and legs that well. They have trained with the bokken and iaito far longer than I. Yet for whatever reasons, they are not allowed or lack the confidence, to train with a shinken and put their body to the test vis a vis their confidence/skills. Not that I would be stupid enough to stand near them when they were trying, of course. The idea of extending their will fully through the body, as if it was their conscious mind, and projecting it beyond their hands, into a tool for example, doesn't seem like an idea people are aware of in training. But essentially, that is what they must accomplish. The will and mind moves first, and the body merely follows. When the mind detects a danger in advance, it will take 9 steps for the body to prepare because it will be 9 steps before the body encounters the threat. Plenty of time. The sword becomes an extension of your body because your nerves have connected it to your muscles and bone. Forms that are hard to do is nice in the sense that it makes students concentrate on their movements. It develops that skill set. They cannot rely on auto pilot, the motor control skills, gross or fine, that they have learned for their entire non fighting life. Btw Dan, I don't think it is a coincidence that both you and Sanko trained from South Africa. The quality of places where they don't take peace for granted, shows in the harmony between intent and action. It's something that is almost impossible to find in the United States, for example. I hope your students understand that they are getting knowledge and abilities at the top 1% in terms of human excellence. At least by my judgment. Which, in the end, is all that matters for those that must overcome life and death challenges: their own judgment. As an aside, you'll note that I don't refer to someone "walking" like a martial artist, but rather "moving" - specifically on the dojo floor (ie. doing martial movement). I agree that mere walking doesn't show anything. Formal stepping in stances is a different matter. In terms of visually reading and predicting movements, the beginner is unpredictable yet easily apparent. The intermediate is somewhat predictable, but makes up for it with efficiency. Then there are people above that level who do things that often times don't make sense to anyone watching it. Because they have achieved a supreme level of efficiency in body mechanics. There are videos of practitioners where it is can easily be seen their level. Let me see if I can find that wing chun one..... hrm it looks like either the author deleted it or it's no longer on my list of sources. Anyways, if you have seen it, it's the one where the users are activating techniques based upon opportunities and context. Also controlling the target and point of impact. Overall, it was easy to see that their coordination abilities were light years ahead of the average. And it didn't look like sport boxing either. The fundamental advantage of a unified standard for promotion and the pedagogical method of teaching is the ability for less experienced teachers to cover more students on a limited baseline. The disadvantage is that it tends to promote people to their level of incompetence, both in terms of students and instructors. Usually an instructor in the Ancient Days had to come up with his own curriculum. If he didn't know how to teach, he usually didn't or only took on one student: teaching through osmosis. Now a days, people buy or obtain other people's curriculums , such as from their seniors, that they don't necessarily understand how to use. In terms of teaching basics, this has increased the cover of how many students can learn them, but limits the depth to which people truly understand what it is they are doing. Often times, even the instructors of the yudansha level teach things not in the way they understand it, but in the way they think they should by following their own teachers. This results in a lack of a cadre, basically instructors that teach instructors. It breaks the lineage chain in some fashions. It may retain the shape, the superficial outer surface, but it starts losing its essence: the tamashi and soul. Right about the point where Funakoshi finished teaching the next generation, this started happening for Japan's karate. And the next few hundred years were about individuals searching out their own path in karate, often without the benefit of Ancient Chinese martial knowledge that backed Okinawan karate users. Yudansha grades can teach the basics relatively well. But if they lack mastery of certain fundamental concepts, they will begin to create students who will never get those fundamental concepts any time this decade, or maybe the next. This produces a "chain" of instructors teaching students, who become instructors, and all of them lack that essential "quality". It doesn't really matter if Obata Toshishiro knows his stuff, when he only teaches a fraction of the total students of his Shinkendo federation. It's very hard to maintain standards, although in some fashions it has become a lot easier with the internet and air travel. It's also why Obata Toshishiro flies all over the States teaching his federation's students personally via affordable seminars. The degree of depth and comprehension, is palpable. Not that his students, who have become yudansha instructors, are incompetent, but there is a huge difference between being proficient at what you do and being your own master at it. Just as there is a difference between being a very competent employee vs being a very wise owner of a business. The decision making process is different, the responsibility is shared differently and originates differently. Giving this topic some more thought and clicking on some of the links, such as "abandoning forms", I do believe this link is good background reading on the topic. 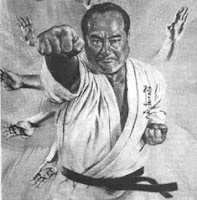 I truly think that a key component of what separates a proficient user in martial arts to a master (of their own domain and time) is the process of shu ha ri. Dan here has obtained the end process and it is ongoing, until infinity or perfection, but ongoing. Yet many of the decades long martial artists I've interviewed, are uncomfortable with even ha, modifying their own forms beyond what they were taught. How someone can think that after 30 years of training, is very strange to someone like me that was trained from a very different methodology. It wasn't a matter of styles or this vs that, but simply an individual, subjective, honest viewpoint martial users had. Even some of the ones that have achieved the end result, don't know how to adequately explain it using words. I'm not sure if the old and ancient masters were right or wrong when they used certain methods to teach the younger generation that no longer had life and death duels to test themselves. Without that basis for comparison and self confidence, students sought out their own path and interpretation in the arts, just as the ancient masters intended. Yet the students ended up in a Very Different place as a result, due to sports and other disharmonies in this world. The more formal and rigid education students got, the more they interpreted that path as the "only right" one to take. Those that broke from the mold, could not really clone themselves in their students, it was up to the students themselves to figure it out. Miyamoto Musashi had many students that sought him out for instruction and to follow him, yet none inherited his Niten Ryu style. Probably because they did not develop as fighters in the same fashion as Musashi, thus they never got to where he was because they didn't travel a similar road. 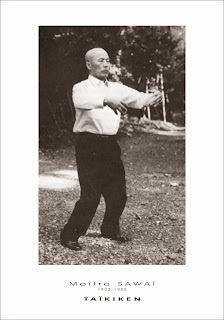 Several posts Dan has written before on the subject of training methodology mirrors the process of shu ha ri as described by completely unrelated individuals, whether Japanese, Chinese, Ancient, Modern, or Western. Unfortunately, it's not a very popular concept here in this part of the West. How is it that such a fundamental concept was left out of people's formal education? What good is formal education and rigidity when students are not even given the most basic of ideas and functions to learn? People might as well just go entirely into self-taught methods, which martial artists of various stripes lambast as being inefficient and wrong headed. Yet to me, the idea that formal education would leave out such crucial, critical, foundational building blocks is even more egregious an error. People focus so much on improving their technique, in sparring and in kata, for promotions and social status, they have begun to become incapable of visualizing the self, the soul and essence of human imagination. How can martial users defeat their enemies when they do not even know themselves? Proficiency can easily be taught using rigid formal doctrines. Not so much mastery and full creative/artistic freedom. 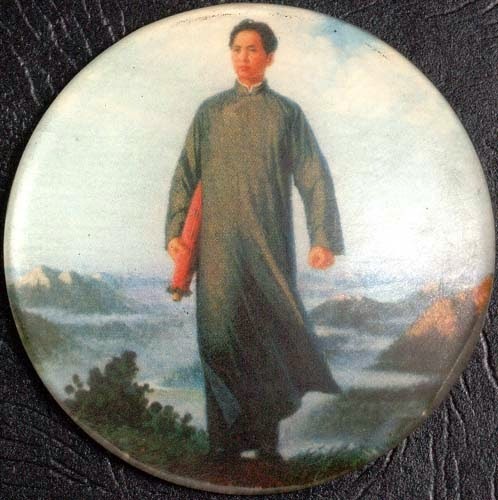 When modern students, irregardless of their point of origin, lack both the martial and the art in "martial art", the result is not going to be pretty. Btw, a real ninja killer jutsu is not known, because all those that saw it died. It's impossible to perceive the killer jutsu. I am curious. Going to the "how is he or she moving" question your teacher posed. Do you think this has to do with learning a form and the "instinctive" movements associated with it? For example, I wrestled my entire life and now try to train in bjj. Grappling is grappling. The same concepts apply, lower, square hips, points of control like the head and wrists. But when I try to strike just goofing around, it doesn't feel natural. The strikes don't flow like the grappling does. Is this the movement you are talking about? The answer to both of your questions is "yes". Just as you were a beginner once in terms of motor learning (the topic of my previous essay) for ground fighting, you are still a beginner for stand up fighting. Of course, you have a much higher awareness than a rank beginner, since some skill transfers from ground to stand up, but you still need to refine that movement so that it is "unconscious", yet effective and efficient. Thanks for reading and for your question. Dear Dan, great article as always. A lot has been said already on the subject, so it's not my intention now to add more words. I'm stepping by just to say -- off topic -- that it is a shame that I haven't found any Facebook Page of your blog. I think there should be one! And it should -- it would/will! -- be liked by millions of people! Dear Dan, this has to be fixed! 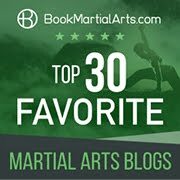 I can tell you it's been a time since I've started searching the internet (and books) for good martial arts info, and I believe most of what we (everyone) initially find is... not very satisfying (some never realize this, though). But I've really found some great sources, there's actually a few already and... yours is probably on top of them. I know there's a feed in your Twitter, but I believe there should be one in Facebook as well. Oh, yes, there's also a FB page for your Academy of Traditional Fighting Arts... so well, maybe there's no need to have another page, but hell, I want to "LIKE" your blog, and I can't! I think many people share this feeling. After all, there's also the point that your blog is a totally different monster, so it deserves its own publicizing, so there'll be a clearer difference between the academy and the blog (people worldwide) public. Off course you could give a link to each other in both pages. I think it's ok to say this in a comment on your blog, so other people can maybe share their opinions. When things aren't natural, the logical frontal cortex and cpu is doing most of the processing and decision making. This is relatively inefficient compared to using the brain's motor control center to do the decision making. It cuts out a few "OODA loops" and makes it shorter. As such people who have to think about moves, have relatively slow reaction speeds, because they are always behind the decision chain. They are always reacting to another person's decisions, such as the guy always on the defensive in chess. Check mate for him is already decided, but he doesn't know that. Thanks Samir. I've now created a FB page for this blog - see this page.